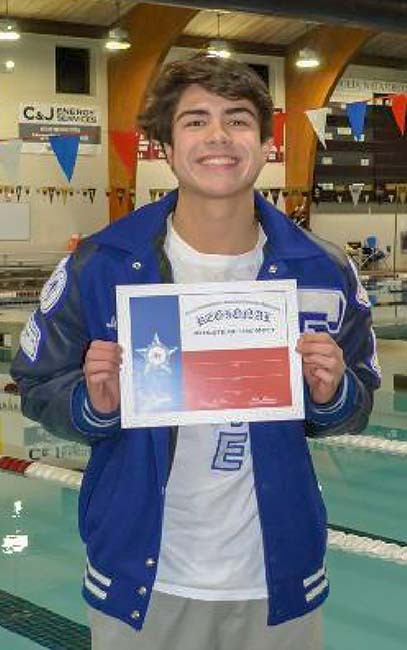 MALE "SWIMMER OF THE MEET" - Friendswood's Max Hardt was named the region's Male Swimmer of the Meet after he won the 200-yard Individual Medley and the 100-yard Breaststroke while also swimming on two relay teams which qualify him for the state meet in all four events. FRIENDSWOOD — Year-after-year, the Friendswood swim team advances to the UIL state swim meet that is held at the Lee and Joe Jamail Texas Swimming Center at the University of Texas at Austin. This year, Friendswood swimmers will compete on February 15-16 at the state meet. Friendswood won the District 24-5A title and they had a great showing at the Region 6-5A swim meet as the boys finished second and the girls finished third against some of the best teams in the region. Magnolia won the regional title for the girls with 390 points followed by Montgomery (379), Friendswood (342), Kingwood Park (278), Grand Oaks (132), and Porter (130). There were 14 other teams that competed that scored less than 100 points. Kingwood Park won the boys title with 444 points followed by Friendswood (372), Magnolia (254), Montgomery (237), Grand Oaks (201), Magnolia West (164), and Tomball (116). There were 13 other schools that competed that scored less than 100 points. Each of the eight Texas regions automatically send the top two finishers in each event to the state meet. There are eight additional “call ups” in each event (based on the top times) for a total of 24 swimmers swimming each event at UT. The top three divers in each region automatically go to state. Boys 100 Yard Breaststroke - 1st place finish in a time of 57.75- Max Hardt and 2nd place finish in a time of 59.91 Josh Haffelder.